Tungnath temple, at an altitude of 3680 Mtrs, is considered to be the highest temple of Lord Shiva and is one of the Panch (Five) Kedars. 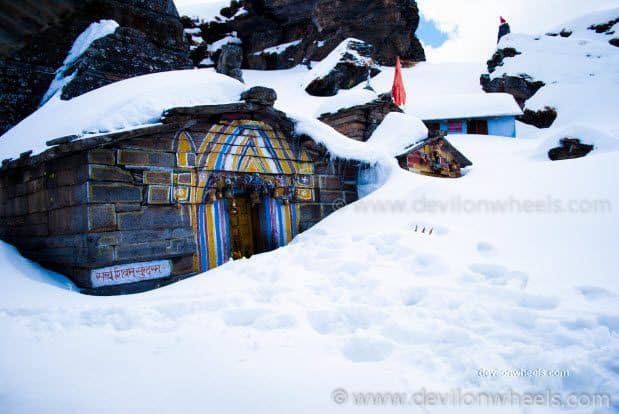 Madhmaheshwar, Tungnath, Rudranath and Kalpnath with Kedarnath form the Panch Kedar and considered as the five most important temples of Lord Shiva in Garhwal Himalayas. Chandrashilla, at an altitude of 4000 Mtrs, is highest point of the mountain on which Chopta and Tungnath are situated. Chandrashilla offers 270 degree views of the Himalayan range and is located 1.5 KMs further upwards from Tungnath Temple which makes it a 5 KMs trek from Chopta. Chopta is situated at an altitude of 2600 Mtrs in Rudraprayag district of Uttarakhand and is well known as a base point for a trek to Tungnath Temple and further to Chandrashilla peak. But, Chopta itself offers a beautiful snow meadow in winters locally called as Chopta Bhugyal (bhugyal meaning meadow). The place is extremely rich in Flora and Fauna and you can find lots of species of birds around Chopta and Tungnath region. Tungnath Temple is located at a trekking distance of 3.5 KMs from Chopta and comes under Rudraprayag district of Uttarakhand. Chandrashilla peak is further 1.5 KM ahead of the temple. Altitude of Tungnath Temple is 3,680 Mtrs or 11,220 Feet and that of Chopta is 2600 Mtrs or 7,925 Feet. Chandrashilla Peak is further ahead at an altidue of 4,000 Mtrs or 12,192 Feet. 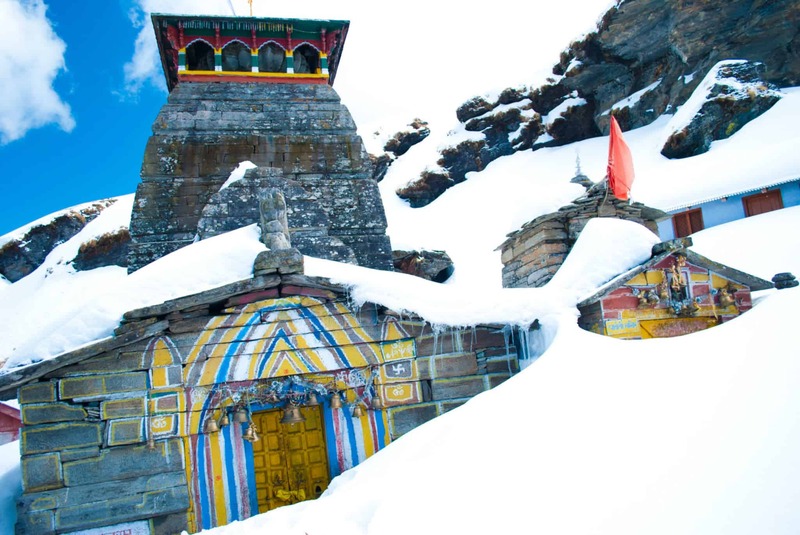 Best time to travel or visit to Tungnath Temple is April – November (exclude monsoon). 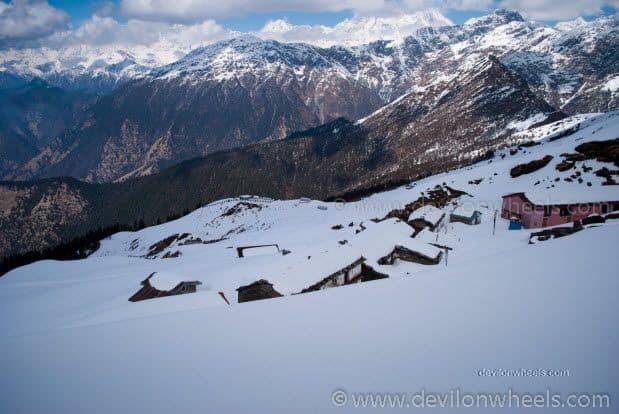 In winters i.e December – February, when the snowfall starts the Tungnath becomes inaccessible. Soon, Chopta also gets snow bound and gets cut-off from the rest of the valley. As the end of February approach, the snow starts to melt around Chopta, Duggalbitta and Baniya Kund which creates a ray of hope for people looking for Snow Trek to Tungnath / Chandrashilla and experience some real adventure. However, be ready to trek more than 6-7 KMs on either side as the roads to Chopta are not accessible almost till March (mid) from December (after snowfall). So, if you are looking for abundance of snow then February (Mid) to March is the ideal time but be ready to snow trek to Chopta from Duggalbitta or Baniya Kund as the road to Chopta do not open up to March (Mid). 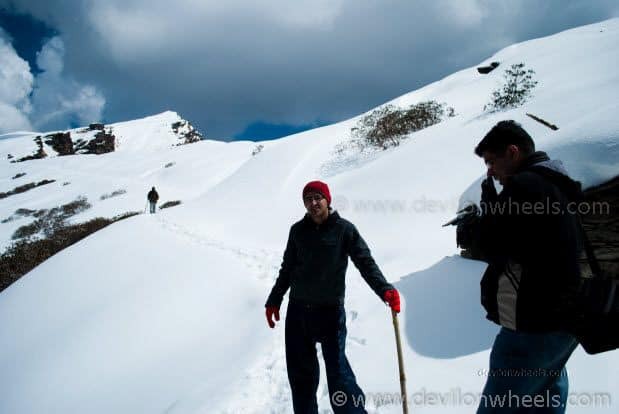 If there is plenty of snow on the trek to Tungnath it is sometimes difficult to climb and complete the trek. It is also worth noting that you may need a guide too if you are doing a snow trek to Tungnath. 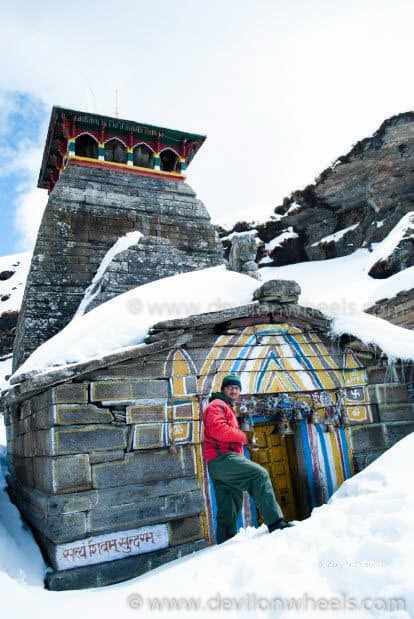 If you are interested in Chandrashilla as well then better make your plans post April (mid) because the amount of snow becomes huge after crossing Tungnath Temple in these months. December to March, Chandrashilla may not be possible at all subject to the amount of snow present and should only be attempted if you are an experienced trekker. 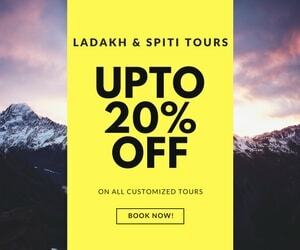 Since, the roads are not be accessible in winters (December to March (mid)) and the options of stay at Chandrashilla and Tungnath are none, you will need to come back to either Duggalbitta or Ukhimath for overnight stay. Hence, do not take any chance and move further, if you feel that you won’t return back from Chandrashilla / Tungnath before the sun goes down. Monsoon season is generally not a suggested time period to visit the region of Chopta – Tungnath – Chandrashilla – Deori Tal. Nearest airport is Jolly Grant, Bhaniawala, Dehradun, 41 KMs from Haridwar. After reaching Haridwar you need to carry rest of the journey by road only. Haridwar to Chopta is about 225 KMs by road. Nearest railway station is at Haridwar. After reaching Haridwar you need to carry rest of the journey by road only. Haridwar to Chopta is about 225 KMs by road. Vehicles can go up to Chopta only and you need to trek about 3.5 KMs from Chopta to reach Tungnath. If you are interested in Chandrashilla, you need to further trek about 1.5 KMs from Tungnath to reach the Chandrashilla peak. There is no motorable road to Tungnath and Chandrashilla. The trek is a paved path from Chopta up to Tungnath temple and from there on to Chandrashilla it is not paved but track exists. People generally complete the trek to Tungnath (without snow) in about 2-3 hours and to Chandrashilla in about 3-5 hours from Chopta. However, the presence of snow on the trek, scripts a different story altogether. The time and feasibility of trek then depends entirely upon the amount of snow present on the trek and the weather on the particular day. When I visited, overall the road conditions were not that bad. In between Dev Prayag and Srinagar the road is quite dusty and at some places in poor shape. It slightly improves after Srinagar and up to Rudra Prayag with few bad sections. After Rudra Prayag the road condition further improves upt o Agustmuni. You can cruise as you like after Agustmuni as the roads are in best of shape up to Chopta. Almost any vehicle (car/bike) in perfect running condition can take you to Chopta from where the trek to Tungnath and Chandrashilla starts. This day you can utilize to go towards Tungnath to see snow (if in winters) and capture beautiful sunset near Chopta meadow. You will also find lots of beautiful birds there, especially, Magpie, enroute Chopta. There will be lots of red colored flowers around April – May, I guess Rotadendrum is the name. In our case, we reached at 5 PM at Sari Village in the evening on Day 1 and hiked in the evening to stay overnight at Deoria Tal which gave us a day extra to trek to Tungnath easily and at comfort. Hence, start early morning from Syal Saur by 7 AM, say, to complete the Tungnath Chandrashilla trek in that day. Stay overnight at Duggalbitta or Chopta or Ukhimath after completing the trek. In the first half of the day, you can even go towards Ukhimath and visit the local temples. After having lunch, you move towards Sari Village and trek to Deoria Tal to enjoy the sunset. Keep in mind it will take about 1.5 Hrs to trek for a normal person to complete the trek. So, start by 3 PM so as not to miss the sunset reflections. Stay overnight at Deoria Tal. The road only goes to Sari Village and hence, you need to park the car at Sari Village. Call either of Bharat Puspwan: 09719875326, 09456108780, Umeid (09411737835), Mr. Hira Singh Negi (09410241543) or Mr. Surendra (09410367921, 08958329376) few days before so that he can book the room for you at Deoria Tal, FRH or arrange tents for you with proper bedding. He will be available for you near BSNL tower at Sari Village. The FRH caretaker will also charge you some fees for entry to Deoria Tal, give him just the tip … he will be more than happy. Enjoy the early morning reflections of Chowkhamba range in Deoria Tal and have your breakfast. On the way back check the local temple of Sari Village as well. After getting down start the journey towards Delhi. You can opt for dinner at Bikano or Moolchand Resorts or Cheetal, all near Mujjaffar Nagar. If you forget the cut to Cheetal you may miss by running over a flyover, hence do not miss that turn from the highway, if you like Cheetal. I will always prefer to stay at Syal Saur, GMVN (Ph. 9536384724) whenever I will be visiting the region next time at least either on the first day or on the last day. It is right next to Mandakini River and an awesome place to spend the evening. I guess there is a Rest House of GMVN at Duggalbitta as well, confirm from Ukhimath, GMVN for the food and the electricity in winters. Hotel Mayadeep is also a good place to stay at Duggalbitta. If you think you can shell some money for more comfortable and knowledgeable stay then perhaps, Magpie Camps at Duggalbitta may suit your needs. The limited accommodation options at Chopta are only open when there is no snow or road is open either from Gopeshwar side or Ukhimath side. April – November is the best bet, you will find them open. There are few guest houses and dhabhas at Chopta. Even Tungnath does have 1-2 guest houses as well. One of them is the GMVN rest house, I guess. There is no electricity at Duggalbitta, Chopta, Tungnath and Deoria Tal. If you think you will need electricity then do confirm with the hotels or guest houses at these places if they have a generators or not. Mayadeep hotel at Duggalbitta may run the generator for you. 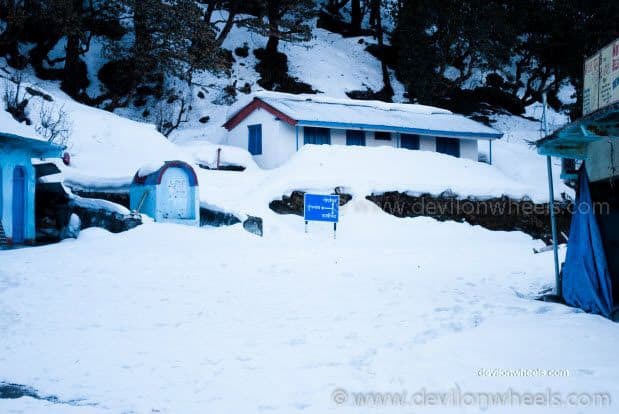 In winters, there is no accommodation at Chopta or Tungnath which you will find open. When there is ample of snow even Duggalbitta is hard to reach. I am not sure of any famous food joint at the place and you will either be eating in the hotel or some dhabha in the day while you are on excursions, as we did on our trip. We couldn’t find any signals of Phone on the trek to Tungnath and Chandrashilla. Nearby Chopta, the phone signals were present but with very poor connectivity. There is no issue of Phone connectivity on the entire route before Duggalbitta. We had BSNL, Airtel and Idea connections with us. Nearest Petrol Pump is at Kund about 7-8 KMs before Ukhimath. I will suggest that you top-up the fuel either at Srinagar or Rudra Prayag. Although there are number of ATMs on the route as well and we used Chandrapuri ATM which comes after Agustmuni and before Syal Saur. Chandrapuri ATM is the closest ATM because I guess there is no ATM present at Ukhimath. Syal Saur to Ukhimath is 18-20 KMs approx. Syal Saur comes first even before Kund when going towards Ukhimath from Delhi. Kund to Guptkashi is about 25 KMs and further 22 KMs is Gauri Kund where the road ends. From Gauri Kund a 14 KMs trek starts for Kedarnath. Ukhimath to Sari Village is 13-14 KMs approx. You need to go straight from Ukhimath and you will find a board on the right side stating directions to Deoria Tal. Here, you need to take a U-Turn towards left for Sari village – Deoria Tal. If you do not take the U-Turn and follow the road coming from Ukhimath then you go towards Duggalbitta – Chopta. Sari Village to Chopta is 32 KMs approx and Duggalbitta is 4 – 5 KMs before Chopta. Overall Delhi to Syal Saur/Ukhimath/Sari Village/Duggalbitta/Chopta are almost alike with overall span of about 50-60 KMs. Hence, from any place you can travel to Delhi in one day without much time difference. You can get in touch with two very good local guides Bharat Puspwan: 09719875326, 09456108780 and Umeid (09411737835), may be if you need they can be of much help with everything and you can directly get in touch without involving any travel agent. Both Bharat and Umeid are good people at heart and lovely company to be with. Bharat is working as guide almost for more than 14 years. You can also check with Umendra Singh Negi at +918958647802 and +919456534062, who runs a dhabha at Deoria Tal and camps as well. There are locale temples of Usha and Anirudh, Shiva and Parvati at Ukhimath which are worth visiting too. It is a great place to go if you really like to see the raw beauty of Himalayas. im planning a trip here in 12 august but weather forecast is showing rain aon all the days. please recommend if this will be a good decision as i am really keen on going there. Hi dheeraj ..m planning to chandrashila in june ..is it the good time to visit ?..if not then where should i visit this june. Himanshu, yes, you can visit Chandrashilla in June. Peak will be clear and you can reach to the top. I will be traveling from Gangotri to Phata and then from Phata, I will take helicopter service to Kedarnath. Considering the climatic conditions in the month of May, please advise me can I cover the distance from Gangotri to Phata in one day if we start at @ 8.00 am from Gangotri. Or else if you advise to take a halt in between, which is the proper place to take halt on this rout. Suggest names of some good places to stay. The tentative date of our travel by our own vehicle (4 wheeler) is 29 May 2017. If you are OK to travel about 10 Hrs, you can reach phata from Gangotri, or perhaps try to reach Uttarkashi the day before and do Uttarkashi to Phata on this day. 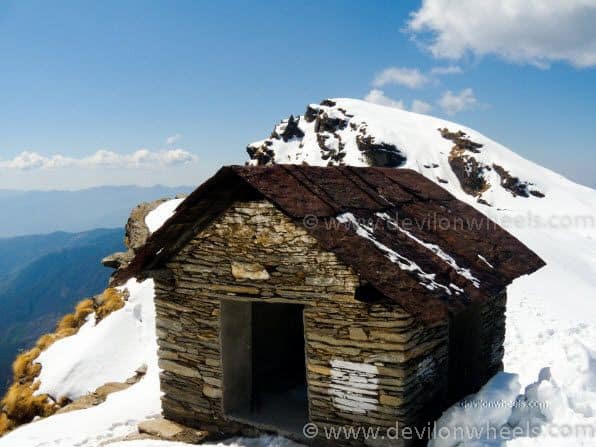 Your blog about Tungnath is highly informative. I am going to travel to Kedarnath in the month of May 2017 (After 22 May). I will be traveling with my own vehicle (4 wheeler). In my chardham yatra, first I will visit Yamanotri, then Gangotri, then Kedarnath and finally Badrinath. This is a normal rout. Your blog has really made me to think about visiting the beautiful place of Tunganath. Since I am traveling in this area for the first time, please advise me about a few things. 2) I am traveling with my wife. Is the trek from Chopta to Tungnath very steep and can we cover it in a day. We both are above 50 and no experience of trekking. 3) If we stay at Chopta, is there any staying arrangement. Possibly we will visit Chopta on 28 to 30 May 2017. Once again congratulations and thanks for a highly informative blog. Chopta is near Ukimath which is near from Kedarnath dham. When you travel from Kedarnath to Badrinath, you can take Ukimath – Chamoli – Gopeshwar route where Chopta will come on the way to it. You can trek to Tunganath in case you are trekking rest of the dhams. It is well-paved path. There are some options of stay at Chopta and Duggalbitta near Chopta. Thanks for a prompt reply. I will follow your instructions and will go to Tunganath on my way from Kedarnath to Badri. Am thinking of going on a bike trip from rishikesh to chopta. Is renting bikes a sensible idea? if so, can you point us towards any good agencies? Also can vehicles be safely parked before the trek from chopta? I m planning for Chopta trip around 5april 2017 with my friend on bike from Delhi. Will it be possible to reach Chopta for tungnath trek nd get accommodation there? Is there guide necessary for the trekking? Will it be possible to reach chandrashila? Well, Chopta may not have anything open but if open, well yeah you should get it. In case there is snow on the route, better take the guide with you else it is marked to the top. Most likely you should be able to reach Chandrashilla. HI dheeraj, we are planning to go to tungnath/chandrashila on our bikes in last week of feb-2017. Is it possible?? we are a little experienced with bike trips. You will not be able to reach Chopta but can reach around Duggalbitta and from there may be up to Baniya Kund. After that I feel there will be too much of snow and you will not be able to ride further and hence, you will have to trek the remaining distance to reach base of Tunganath/Chandrashilla trek. Hope you are good. Writing to you again for getting your tips. As you suggested in my earlier query, we (me & wife) are going to Chopta to see snow in the last week of Dec and have booked Hotel Mayadeep for 3 days. As we don’t have a group, we need to plan everything ourselves. Could you please suggest some itinerary about how we should plan these 3 days to see the places around properly ? Also it would be a great help if you suggest important things required to carry in this time/weather and if any pre-booking is needed for the sight seeing & guide ? 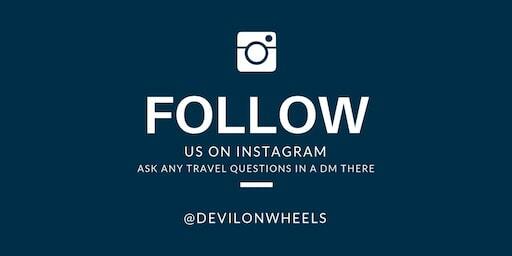 I have some plan and preparation but as I’m not a frequent traveller It would be of great help for us and for other people who visit this blog as well. Looking forward eagerly for your help. hi am from kerala .is it good to visit chandrasila in november and how can i reach choptha from haridwar or dehradun (public transport or share taxis) and how much expense will take for 5 days stay at chopta including travel .am expecting ur reply ASAP. I think Aravind I replied to you on the FB message. We are planning to visit tungnath on 31st Dec 2016, is it the right time to visit? are the places really inaccessible during end of december ? we are 6 peoples so please suggest if it is the right time. we want to go till chandrshila as well. Sher, the trek should be doable in case it is not snowing up there. 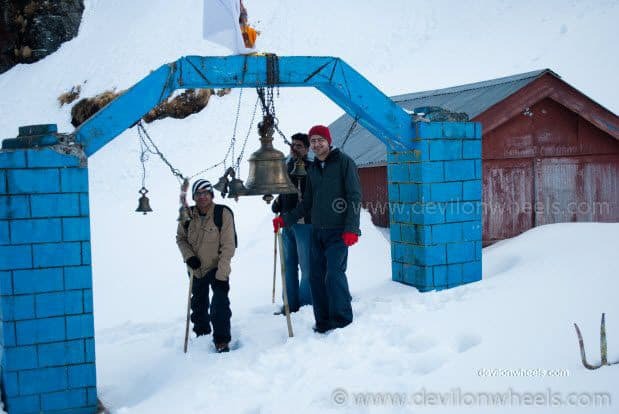 Chandrashilla trek depends upon the amount of snow. At times, it is fine and can be trekked in December. Thanks Dheeraj, I talked to one guide Bharat as well. he is very nice person , he told me about everything we need to know to go there in end of the year. I got his number from your article. Thanks Bro. keep writing such articles so that we can plan a trip very easily to unknown places too. Thank you Sher, please pass on my regards to Bharat. They deserve more than that and always happy to help in any way we can to spread smiles in Himalayas. Have a wonderful trip. I wanna plan trip to tungnath temple uttrakhand with my family. Can you explain details. How to reach, money packages and all. Bro,we are going to chopta in 1st week of September, will reach haridwar on 1st september at 6am.is there any bus service from haridwar to chopta or ukhimath?Is it safe to go there in monsoons? Can we get glimpse of snow there?plz tell about all these things! Sorry Ramesh, do not have much idea of the bus. But, I strongly feel that there should be some bus for Ukhimath from Haridwar for sure. Snow might not be possible in September except distant snow views. Thanx bro,1 more question, we are 6 adults and 4 kids below 5years,we have 6days,will you plz tell where can we go including chopta within this limited period? Ramesh, I will suggest to just be around Chopta and Deoriatal. You can spend couple of days at Deoriatal and couple around Chopta. Around there, you can also visit Guptkashi and travel to the point where trek to Kedarnath starts. We are planning on going to Tungnath Chandrashila during diwali. Can anyone tell me the closing date of Tungnath temple? Great blog. Its very informative and helpful. We (4frnds) are planning to visit chopta on 30th May 2016. We will be starting from Delhi. Few queries. Whether Honda city/i20 will be suitable care for this journey from Delhi to Chopta. If we start at 9:00pm from Delhi , can v reach chopta by 5:00 pm next day. How will be the weather at chopta. Should we carry winter clothing.? 3. Yes, you can easily reach by that time in fact you will reach in morning itself. Hope you are back from your trip and had a good one. Can you please let me know the road and weather conditions at chopta. We are scheduled to visit on 10th June 2016. What are the stay arrangements like and contact number of any one there would be good to have. Sandeep, there are already some numbers up there to contact. Hope they help. Thanks Dheeraj. We visited Deoria,Chopta,Tungnath and chandershila on weekend. It was a wonderful trip. Your article proved to be a great help. Great Info. We are palnning to do this itinerary stqrting 31st May. So is it a good time? Also can we trek to deoria tal in eve? And head to tungnath and chandrashila from deoria tal in morning?how much is the distance? When to return back?same day or next?and to where? Hi dheeraj, thank you so much for the lovely blogs you’ve been writing.. I am planning to go till chandrashila but I have only Friday night to Monday nights time. I was also thinking of doing the river rafting at rishikesh , so is possible all to cover up if I rent up a bike and travel on road? And I am planning this trip April third week. Is it a good time to visit and Can I make it up to all ? We are planning on going to Chopta around May 6th – 11th. Please confirm if this is a good time to go and we will be reaching Chopta Via Delhi. Please suggest an itinerty. You should be go to travel to Chopta during that time of the year. The weather will be cool up there not cold but there wont be any snow at Chopta – Chandrashilla during that time of the year. I came back from Chopta (day before yesterday: 27th March). Its an awesome place to visit for peace. You can even listen to your breath at the top of chardershilla. You may not find snow in May but currently the view is completely surrounded by snow. One must visit this place in our lifetime, All the best!. Awesome Yogesh !! Thanks for the update. How about sharing them with all of us in DoW Community? Firstly I would like to thank you for this blog, it helped me a lot as I use to make a plan in my brain and then on paper with the routes and places to explorer. This blog of yours really helped me to discover long lasting destination Tungnath jee and Chandershilla. Thanks for the offer to share the traveling experience, I will definitely do that. I am processing the natures photographs which I tried to captured in camera. Once done I will create a blog and will surely share the experience with you all so that it can help someone. I have already covered some of the trek’s and converted them into words at http://www.yogeshraheja007.blogspot.com which is my personal blogging site.